Creative fun children fruit fork - toys that babies can play with. The lovely little ant moves the modelling, the fun that stimulates a baby to eat fruit. Cute animal and creative design, cute, used to decorate fruit bento, arouse children's interest, recommend 24 months of the baby to use. Food grade material, not easy to break, health and safety. Creative design to increase baby's cognition. Cute look, stimulate the baby's appetite. FASHION DESIGN - Funny design will make your kitchen and home pop. The set is decoration-friendly and useful. 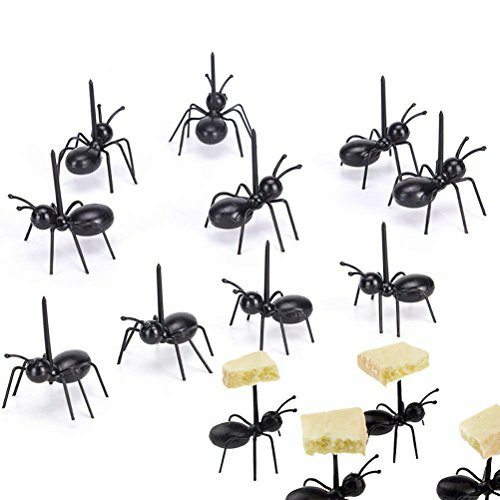 VIVIDLY ANTS TOOTHPICKS MAKE THE FRUIT MORE FRESH AND CREAT A LIVELY ATMOSPHERE! If you have any questions about this product by TableRe, contact us by completing and submitting the form below. If you are looking for a specif part number, please include it with your message.